These are splendid Giant Fossil Armadillo Scutes or Osteoderms. The large one is the flex scute and the other is stationary. 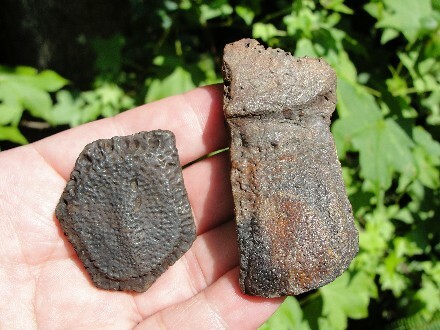 Excellent examples of scutes from the Giant Armadillo's armored plating or shell. These Giant Armadillo's had hundreds of these scutes while alive. 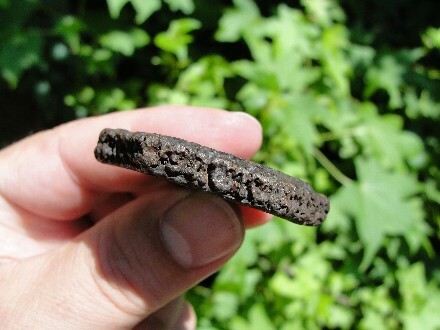 These prehistoric fossil scutes have no repairs or restorations. 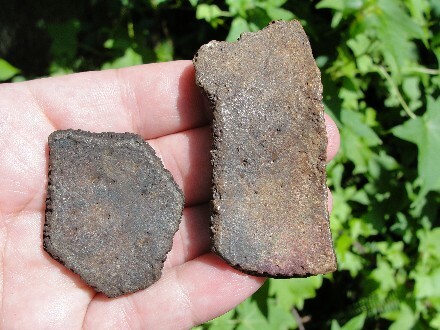 Nice set of two different types of scutes from the same type of armadillo. Actual Specimen Pictured & Guaranteed Authentic. Holmesina septentrionalis was an extinct, giant 6+ foot Armadillo that weighed about 500-600 pounds. 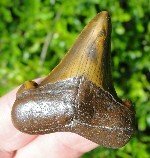 It was twice as big as its relative floridanus. These armadillo fossils are part of the group known as Edentata meaning “without teeth”. Most Armadillos have basic peg-like teeth, but with no incisors or canines. Their peg-like teeth have no enamel on them. This is an evolutionary trait from eating ants, grubs, and other soft bodied insects. Their teeth grow continually and never wear out. Holmesina had hundreds and hundreds of the bony scutes in either a rectangle or pentagon shape. These dermal ostroderms, or bony armor scutes, protected the animal from its enemies. The top of the head has scutes grouped together for a head shield. Rings of overlapping articulating scutes or osteoderms help form the shell or carapace of the body. 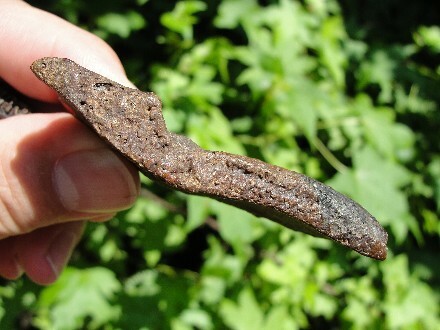 Some osteoderms making up the carapace are movable and others are not. The movable osteoderms give some flexibility to the carapace in the living animal. The tail has a complete covering of rigid grouped rings of osteoderms. 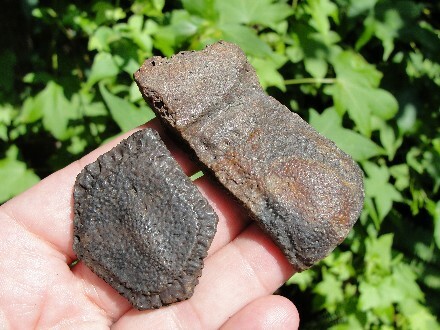 In Holmesina, these scutes or osteoderms are thinner and absent of the “rosette” pattern as found in another giant Ice Age Mammal Edentate, the Glyptodonts. The armadillo fossils produce evidence that suggests these animals migrated from South America by way of a land bridge to North America, starting in the late Pliocene period.